The ticket above may be rendered useless (and hopefully refundable) by Monday. That’s because Levi’s Stadium is having a bit of a grass problem. Sod that was planted in April came up in chunks and was causing falls during Wednesday’s in-stadium practice session, forcing Jim Harbaugh to relocate the session to the 49ers’ practice facility next door. Thousands of fans who attended the session went away disappointed. Today the stadium’s grounds crew began the process of replacing the middle thirdthe entirefield from goal line to goal line, first ripping out the old sod that wasn’t taking root. New sod is expected to take root in around 2 months, so it’s not as if there wasn’t ample time for that to occur. When the Earthquakes hosted the Seattle Sounders 2 weeks ago, I found it curious that sod seam lines were still visible on the pitch. While the field was playable for that event, it suffered mightily under the trampling of 300-lb. linemen. The grass variety in use, West Coast Turf’s Bandera Bermuda, is not considered the cause of the problem, though the 49ers haven’t officially said what the cause is. Niners Nation claims that the sand base under the sod is the culprit. To get the field ready for Sunday’s game vs. the Chargers, the team is getting more sod rolls from WCT to fill in the area around the hashmarks. That sod will be extra thick at 2 inches, giving the sod a chance to stay integrated for at least this one game. That’s considered only a temporary fix, since such installations are not designed to permanently take root. After that sod is used, the entire field will be torn up and the subsoil system replaced, in favor of a revamped system that will hopefully allow the grass to grow better into the base. I don’t think is what the 49ers meant when they advertised Levi’s as the greenest stadium in America. Tearing up, replacing, and irrigating sod multiple times over isn’t green in the slightest. Typically stadium operators keep a small sod farm near the stadium so that bad patches can be easily replaced. It’s also common for the grass suppliers to keep a large amount (literally acres) available for customers in case of emergency. While Bandera Bermuda is a relatively new grass variety, it isn’t untested. The surface is in use at Petco Park, Raley Field, and was used in the end zones at the Coliseum a couple years ago as a test for the Raiders. The stuff has also been installed at the Rose Bowl for UCLA’s upcoming football season, and was used at California Memorial Stadium for the exhibition soccer match between Real Madrid and Inter Milan. While the field didn’t play as smoothly and quickly as a permanent grass installation would, there were no severe complaints and most importantly, no field-related injuries. After the match, Cal Athletics worked on installing the lower-maintenance Field Turf surface at Memorial. As seen with the soccer-vs.-football experience dynamic this week, using the same strategy at Levi’s as the one used at Cal is no guarantee of success. The players could tear through the new sod just as they did with the original grass. However, the extra weight and root structure should help the field withstand the pounding. The field is also expected to stay through the following Friday (8/29), a high school football doubleheader. By midnight on Friday the field should be shredded into oblivion, seeing that there will be three football games played there in six days. If the field doesn’t make it through this Sunday’s game, the high school games may have to be rescheduled for other locations or the home schools’ respective fields. I’ve been looking forward to Friday Night Lights, since it’s the cheapest priced event at Levi’s so far ($20) and the seating is all general admission, meaning that fans can sit pretty much anywhere that’s open (probably the lower bowl only). It would be a shame if the event were cancelled, but if the injury risk is too high, no sense in pursuing it further. There are many growing pains associated with opening a new venue. Unfortunately for the 49ers and fans, some of them have been painful (traffic for the soccer game) or even lethal (a man died at last Sunday’s game from heat-related causes). Everyone’s a guinea pig until things are ironed out. Here’s hoping that the new field takes hold, so that the focus is on the ball and what the players do with it, instead of the surface. After all, we already have one compromised stadium to deal with in Oakland. I’m pretty sure this sod is Lew Wolff’s fault. I’m not sure how – I’m just certain he’s to blame. Levi’s growing list of problems: Heat, torn up grass that won’t take, traffic, overfilled Light Trains. But no tarps. And no t.v. blackouts from a half-empty stadium. How about the fact the stadium was nearly empty after halftime because fans were concerned about the terrible heat and worried about the traffic after the game. Tarps will come in due time. Dream on, Elmano. There hasn’t been a 49er game blacked out in the 25 years that I’ve lived in the Bay Area. Can you say the same about the Raiders? Nope. Thanks for shitting up the comments so quickly. You are truly a great representative for the City of Oakland. (That’s sarcasm all the way since I know you won’t understand that unless I explicitly state it). The Raiders did have twenty years of sale outs and if they had not left for LA it probably would have been more, but you are correct. Even as KPIX TV and KRON along with other owner friendly media organizations keep endlessly promoting this lemon to the Bay Area masses, there is no denying that Levis’s Stadium is a complete disaster. From the congestion and horrible access, to the incredible heat generated by an open stadium with red seats no overhangs and a huge glass structure reflecting dangerous heat back on the fans, to the planes flying directly over head from San Jose Airport, to the inflated prices, and now to a defective field, this place is a lemon of the highest order. If it weren’t for the local media promoting this thing and covering up for the Forty Niners, this whole fiasco would be exposed including the death of a fan sitting in this dangerous and overheated stadium. This stadium has huge problems which will not be fixed by glossing over the real issues. The lousy and defective sod is the least of the problems for this massive mistake in Santa Clara. Let’s see: O.Co Coliseum spews raw sewage, has tarps on a huge percentage of seats, can’t sell luxury seating, has antiquated rest rooms and is recognized as the worst stadium in both of the two major sports leagues: MLB and NFL (quite an accomplishment). 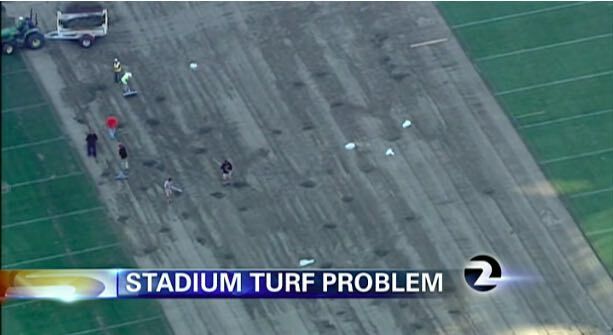 Meanwhile, the Raiders have to play on a baseball infield and the A’s have their outfield torn up by football cleats. But it’s Levi’s that’s the “lemon.” OK. I think I understand now. Levi Stadium could use a giant tarp for shade in order to keep the fans safe from heat stroke. ML, can you do something about this? Elmano is literally here ONLY to troll. Not have any sort of topical discussion. SMG, you should be dealing with the issues instead of asking for me to be censored. Everything I brought up is true so why would you want these issues censored? SMG, I’m not the one whose been disrespectful while using profanity against other posters. You are the dictionary definition of a zealot and you routinely insult the intelligence of other and tell them they don’t know how the world works despite the FACT that you WILLFULLY IGNORE all available evidence that points to your assertions being wrong. You are a cancer to this blog and should be ashamed that you represent your city in such an abhorant manner. If the Raiders end up playing at Levi’s I wouldn’t go to the games. I don’t go to the games now so I certainly wouldn’t head to Levi’s and put up with all the problems. Elmano does not even live in Oakland, he is a Plesanton resident. Who cares where I live? Does everyone here live in San Jose? It’s immaterial where any of the posters here lives. Except that you have claimed to live in Oakland and regularly refer to it as your city. I consider Oakland my city and I’ve never claimed to live in Oakland on this site. You’re making things up. We should be talking about the issues regarding Levi’s Stadium instead of where I may, or may not live. What can be done to make Levi’s Stadium work for Forty Niner fans? That’s what the discussion should be about. It has nothing to do with distance and convenience. I’m a little deeper than that. Elmano: You live in a San Jose suburb. Pleasanton is 24 miles from Oakland and 22 miles from San Jose. San Jose is your city. How do the Forty Niners correct the problems at Levi’s Stadium? What can be done about the traffic and congestion? What can be done about the heat? Do the flights from San Jose Airport bother you? Do you like the open stadium? Is the stadium loud enough and does it provide a home field advantage? Do you like the way the stadium looks from the outside? How do you feel about the huge glass structure and the reflecting sun? What type of sod would you use? Are these problems long-term or will things improve in the future? I never said that “if you don’t live in the city you’re opinion doesn’t matter.” I don’t believe that and I would never say such a thing. What can be done about the traffic and congestion? ==> With more time to figure out patterns, fans will adjust. What can be done about the heat? ==> Once Fall is here it will be cooler, wear a hat, drink plenty of water. Is the stadium loud enough and does it provide a home field advantage? ==> Will be determined first regular season game. Do you like the way the stadium looks from the outside? ==> No, would prefer something that looks like a space ship. but this design gets me closer to the field. How do you feel about the huge glass structure and the reflecting sun? ==> It provides shade, so i have not seen any reflection. This structure keeps the upper deck lower, I been to Cowboys, Patriots and Ravens stadium, upper deck seems so high. Why even show up? What type of sod would you use? ==> Not an environmentally friendly one, but one that i know works. Are these problems long-term or will things improve in the future? ==> Short term. With time and money things get fixed. Though I try my best not to be drawn into responding to dumb crap Elmano says, this time I will. I was at Levi’s Stadium on Sunday. It was no hotter there than it is on an 80 degree day in the Oakland Coliseum (of which there are many). If you’re going to sit in direct sunlight in a giant concrete structure on an eighty degree day, you’re going to roast. No doubt those fans in the sun at Levis were roasting. I used to roast in my seats on the east side grandstand of the Coli as well. Just because the Niners fan base isn’t yet used to dealing with the sun doesn’t mean it’s hotter or more of an issue there than anyplace else. Nor was the traffic notably worse than it is getting into the Coli with a comparable sized crowd. Santa Clara is warmer on average than SF or Oakland. Also, I can’t remember heat ever being a huge issue in Oakland. It gets warm in Oakland at times but nothing compared to the descriptions of what people were experiencing in Santa Clara. Someome died either from heat stroke or possibly a heart attack. We shouldn’t try to minimize the problem. There is no problem weather-wise. Santa Clara has some of the mildest weather in the entire NFL. Many times when I take my kids to the water park at Great America it’s too cold to swim because of the winds coming off the bay. Further, the average high temperature in Santa Clara is only slightly higher than Oakland in August and September and virtually identical the majority of football season (October, November, December and January). It must be tremendously liberating to post free of any constraints imposed by facts or logic. I will say one thing for you Elmano, you sure managed to unite the entire comment section of ML’s website. Nothing else seems to have been able to do that. It has more to do with the design of the stadium and the way it conducts heat than it is about describing average temperatures in Santa Clara. There was a problem with the heat inside that stadium. Many fans stated it was unbearable. It’s more than saying it was only 80 degrees out there. I was at the stadium; you, so far as you’ve told us, were not. Apparently, you’re relying on a few quotes in the newspaper. Not a statistically valid sample, and if the same question were asked anyone sitting on the east side of the Coli (or in direct sunlight at pretty much any giant concrete stadium) after a summer or fall game they’d say the same thing. Bottom line: Your argument is based on nothing more than some random quotes from a handful of unprepared fans who are used to Candlestick and your own bias that anything in Oakland is Shangri-La and anything in the South Bay is from the eighth circle of hell. I hope Elmano doesn’t get banned. He’s too entertaining. I hadn’t driven to coliseum in years because I always take bart. However, a couple weekends ago I had to, and it took about an hour to get out. Also, everyone knows that it can get quite warm, or quite cool depending on what foul line your on during day games. These are all issues you get used to. It’s not like santa clara is like Tampa where for it can be 90 degrees with 90per cent humidity. I am happy for niner fans. I love football, but it’s the worst sport to watch live, so I have no interest to go to cal, coli, or Levis. I am actually more excited for the earthquakes New place, but Elmano will complain the seats are too steep and its too close to the airport. wait it’s going to be 80-90 degrees at every 8 plus home game for levi’s stadium forever? damn global warming! We must have be one of the few fans who were actually a little cold at the Niners/Broncos game. Our seats are in the last row (row 36) under the overhang. At no time were we ever in the sun, that coupled with the fact that there’s a constant breeze coming off of the concourse made things a little chilly. There’s deffinately an art to trolling. Some have it, some just don’t. Some make a sad attempt and just end up looking foolish (cough**harry**cough). Through almost a decade of visiting this blog, I’ve seen them come and go, but there are only two that I would call “Masters”. The Navigator and JK-USA. Jedis of their craft.The way they pour their heart and soul into it. How well they write. Sometimes they actually make some decent points that throw you off and get you thinking! That, my friends, is an art! God given and I for one appreciate The Navigator Resurrected. Put me in the “Don’t Ban Elmano ” list. It’s a pathetic hobby. He should take up a more normal hobby, like masturbation. It would amount to the same thing but annoy fewer people. Larry, you’re not bad yourself. I’d say you’re approaching Jedi status. I know to some it may seem like entertainment and “trolling,” but, I really do believe everything I write. I’m sincere in my beliefs and every site needs respectful conversation even when people disagree about a subject. Yeah I doubt the grass itself is the problem. Petco Park’s grass is always immaculate (it’s one of the few fields that actually looks nicer than the Coliseum’s also immaculate turf during the non-football season). Hell I actually have a 5×5 square of the turf from Petco on my patio that has thrived despite the fact I don’t really take the best care of it. It’s a high sun turf that loves being warm and in direct sunlight. And it takes anywhere, even in a pot filled with very old dried out potting soil as a base. I did notice a good sized brown patch of grass in the south end zone area of Levi’s during the quakes/Sounders game. It almost looked like tire marks, but I didn’t think anything of it. Not sure if it was related, but never did I think that they would strip the entire field. Sounds like they just didn’t build the underlying system properly. And if the base is broken the field will never take properly. They’ll figure it out eventually. it’s not like Santa Clara is a hard region to grow grass in. The field looks especially nasty in today’s exhibition game. I hope they get something worked out by their first real game. Also, I’m thrilled to know that Cal hosts Oregon here on 10/24. Given that I work about a mile for the stadium, it might be a great day to call in sick.